The Fourth of July ends with an explosion of fireworks, why not start it with an explosion of fun? Donuts are a quick way to start off what’s almost always a busy day. Prep these up the night before and you can hit the beach running. Place the donut on the end of the skewer – Don’t run the skewer all the way through the top of the donut or it will be more likely to slide off the skewer. Melt the blue candy melt in a bowl in the microwave for 35 seconds, then stir it up and heat for another 30 seconds and stir again. You should have a nice even texture with the melt. Dip or coat the donut about 1/2 of the way up. Before the candy melt dries, cover with your sprinkles. You have to be fairly quick with this or the sprinkles won’t stick very well. Stand the pops in a glass or jar to harden without flat spots. Repeat until you’ve decorated half of your donuts. Melt the red candy melt as you did the blue and repeat step 4 with all remaining donuts. When all donut pops are finished, store in a cool dry place. These are a fun little breakfast treat and really easy to make. You can take them on the go or place them in a glass or mason jar of cold milk for a dipping. Serve with a smile and get lots of smiles! 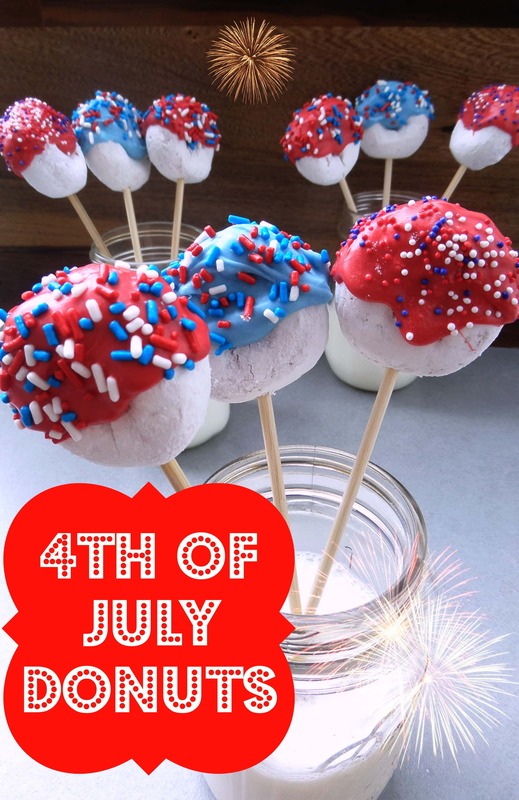 You are sure to win them over with these fun pops and it’s a tasty way to start Independence Day.